This version of kaldereta is the pork version of the well known beef kaldereta. 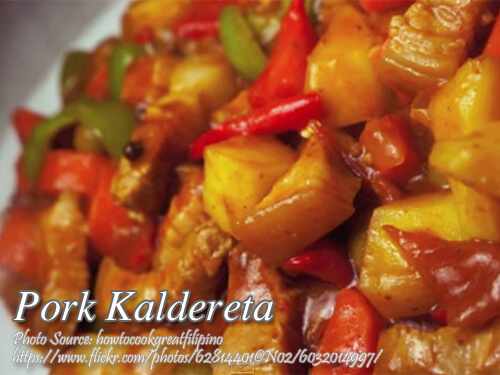 Although there are many kind of kaldereta in Filipino cuisine that make use of goat meat, duck or chicken meat. This is a Filipino tomato based stew which you can use either tomato sauce, tomato paste or fresh tomatoes. Cooking this this involves sauteing the pork with garlic, onions and tomatoes until the meat is brown. So why still use fresh tomatoes since we are already using tomato sauce? This will add more flavor to the meat since you are also browning it first. As much as possible don’t omit the green olives since it gives a distinct sour flavor to the dish. But since they are expensive, you can use pickles as an alternative. Liver spread is essential because it will not be a kaldereta dish without the liver spread. But if you really can’t find liver spread, as an alternative, and I think it is better, is broiling a piece of pork liver and chop it finely. 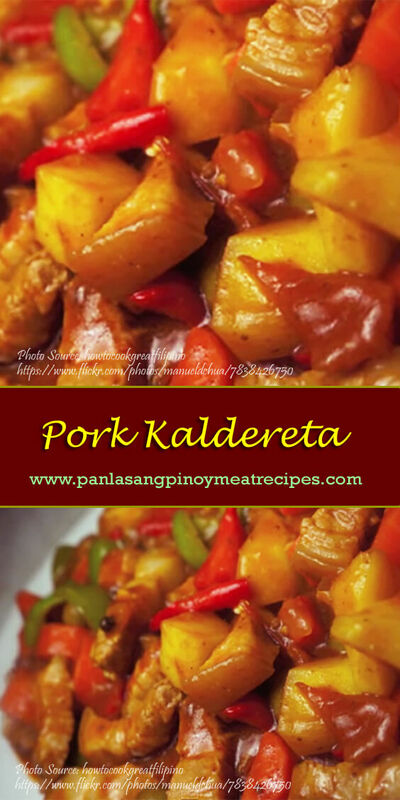 This version of kaldereta is the pork version of the well known beef kaldereta. In a medium size wok, heat oil and saute garlic until fragrant. Then add onions and stir until soft. Add in tomatoes and stir cook until it becomes soft and the oil turns to orange in color. Then add the pork belly and saute for about 4 minutes or until the pork turns to brown. Pour in water and add peppercorns then simmer in medium heat for about 30 minutes and cover. Add the patis, liver spread, and pork cubes. Mix until the liver spread is well combined with the liquid. Add the tomato sauce and bay leaves. Mix again to combine. Then cover and simmer for about 20 minutes more. Then add carrots, potatoes, olives and chili peppers. Mix and cover then simmer for 7 minutes. And for the finale, add the in the bell peppers, cover and simmer again for 3 minutes. Serve hot with steamed rice or fried rice. Peppercorn is also known as “paminta” or black pepper. Just followed this recipe and it taste so good! thank you! Hi Lexy, I’m happy that you liked the recipe! Cheers! Just tried this, but used 1.5 kg pork so adjusted some of the ingredients to taste, and used a whole can of Reno liver spread (because I LOVE liver spread). The result was fantastic! Thanks so much for posting this recipe. Will make again. Hi Arlene, I’m happy to know that cooking this recipe was a success! Thanks for visiting and sharing your comment!